We supply a complete range of water filtration equipment for town and tank water requirements. 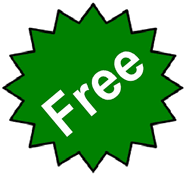 Whether you’re needing to remove the chemical cocktail in your town water, or the health endangering microorganisms present in tank water, we have the package for you! 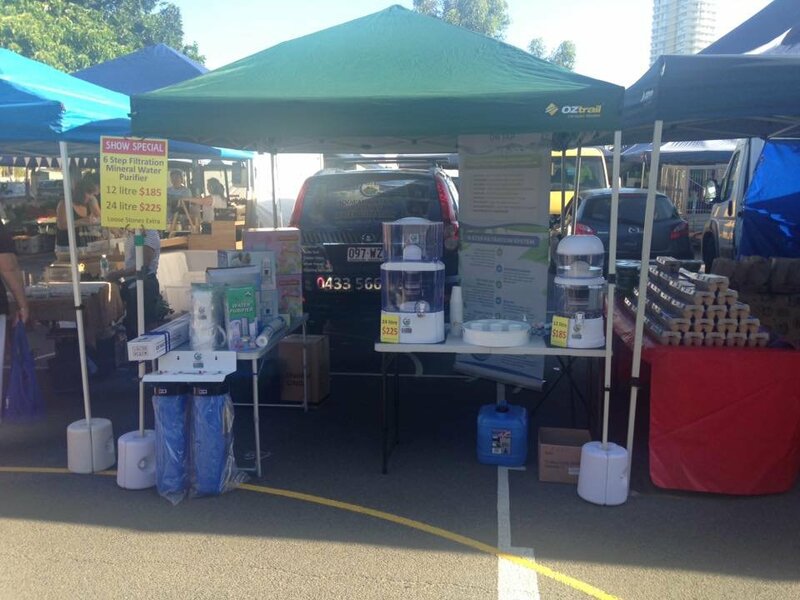 Our range includes under sink units, benchtop filter units, whole house UV systems, alkalizing bench top water fountains and all replacement cartridges for each of these units. 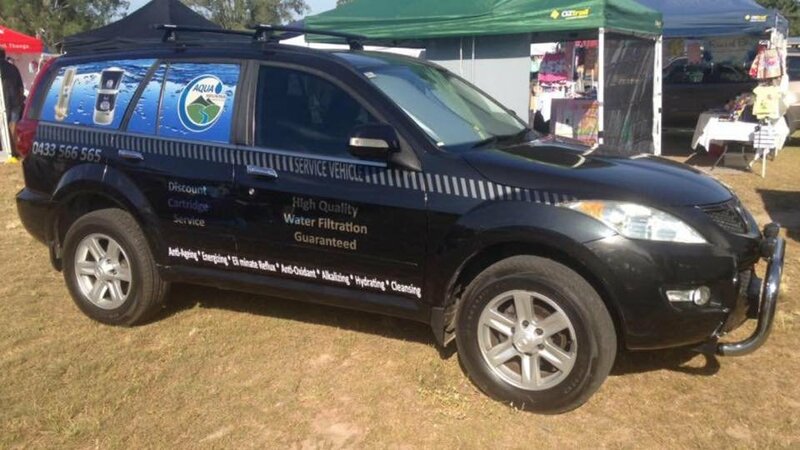 We deliver to the Gold Coast, Beechmont, Tamborine Mountain, Canungra, Tamborine Village, Jimboomba and surrounding districts, and Brisbane. Credit cards accepted. If you are a city dweller and don't mind a chemical cocktail as your primary water source, or a rural dweller and rely on a rain water tank system to drink and bathe in, then you will have a massive chemical collection and also an e-coli, bacterial and parasite issues to contend with in very unstable acidic unbalanced distilled tank water. Many of the chemicals like Chlorine used in our town water are found to also destroy the good bacteria that form our first line of defence in the immune system, hence humans end up 'catching' many bad microorganisms floating around because the good microorganisms (our first line of defence in the immune system) have been killed off by these chemical anti-biotics. As is chlorinated / fluoridated water equally potentially dangerous by drinking, also bathing and showering pose a risk by absorbing large amounts internally and externally through digestion, skin absorption and inhalation of chlorine as a chloride gas. Rural tank water is equally as potentially dangerous as town water, but for many different reasons. As storage tank water is completely delivered from rain water via building roofs and downpipes along with a multitude of debris including dust, chemical crop sprays, dead possums, rodents, snakes, birds (that hit upstairs windows) mosquitoes, frogs, toads, worms, parasites, insects, Guardia, Cryptosporidium, air pollution from industry and vehicles, etc. By far the greatest potential risk to health comes from contamination of water with harmful microorganisms such as bacteria and parasites from bird or animal droppings, (faeces) resulting in large e-coli build-ups. Most water storage tanks contain large e-coli build-up. Rainwater tanks can also be contaminated from roof or plumbing materials. Tank water, is basically distilled water, water that hasn't had the opportunity to 'earth-out'. That is, to fall to the ground and 'run' over the mineralised earth through a short distance of water courses, stream, rivers and finish its journey at the ocean- in a naturally mineralised balanced state, undrinkable, but very balanced and dynamically healthy to bathe in as the skin absorbs the mineral/ nutrient rich sea water. Therefore rain (distilled) water is very acidic 'dry' and hungry water. What happens when we 'trap' this out of balance' liquid in storage tanks is disastrous to the human body. Even the concrete and iron storage tanks are eaten away rapidly by this 'hungry' acidic liquid trying to magnetically balance its pH levels by eating out the tanks alkaline minerals like lime, potassium, sodium, calcium, magnesium, iron, etc. The same thing happens in the human body, creating massive free radical damage, robbing minerals from body, bones and teeth. The human body is constantly ravaged by this hungry out-of-balance-critically-unstable-liquid as we gulp it down as drinking water and draw it in through our skin through showering, bathing and teeth cleaning / rinsing.The results are catastrophic with this hungry liquid electrically charged to attract to its opposite polarity. Thus stealing our valuable minerals from bone, teeth and body reserves in its wild attempts to stabilise itself. The food digestive system is severely restricted by continually drinking acidic rain water and town water as the stomach requires alkalinity before a meal to paradoxically trigger hydrochloric acid for proper digestion. Distilled water is also 'dry' water insomuch as it cannot penetrate our cellular system so the cells are not hydrated by this unstable liquid, as the cells actually repel this out-of-balance liquid. The cellular system requires balanced mineralised clean stable liquid to magnetically attract to the 100 trillion cells within the human body. 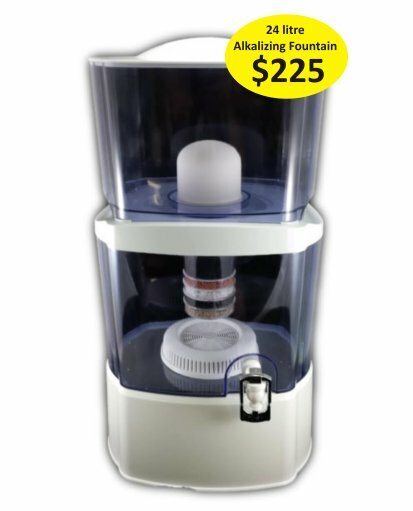 So very important is to filter our water with an 0.2 to 0.5 micron (half a micron) filter to remove bad bacteria, e-coli, chlorine, Cryptosporidium, Guardia, etc, and if possible to run our drinking water through our Benchtop alkalising mineral pH balancer. Any filter beyond 0.5 micron (half a micron) will NOT be adequate. ie: One micron to 5 micron filters are completely inadequate for rural or town water and will only work to remove organic waste particles and chemicals. 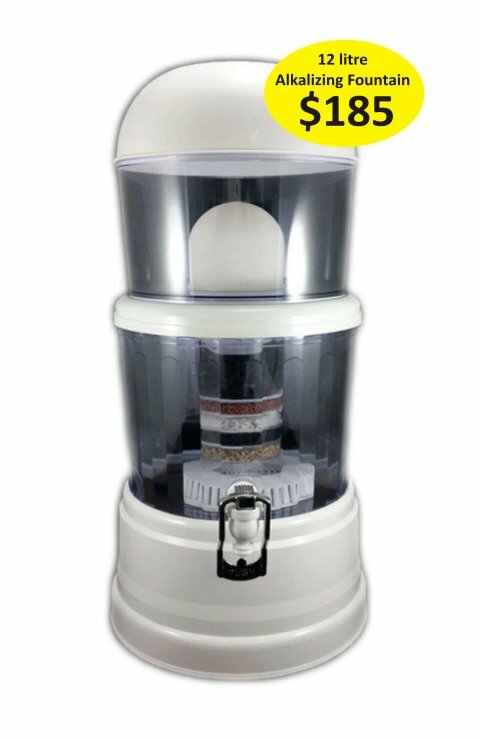 Fully protected drinking water with 0.2 to 0.5 (half) micron benchtop tap fitted filter. Conveniently effective. Bacteria and Parasite full protection. 12 litre & 24 litre. Mild alkaline crystal clear soft drinking water. Manual filling gravity fed upper holding tank. Chlorine & Parasite full protection. * Under sink units available. * Full house filtration with UV. * Shower filters 0.5 micron. 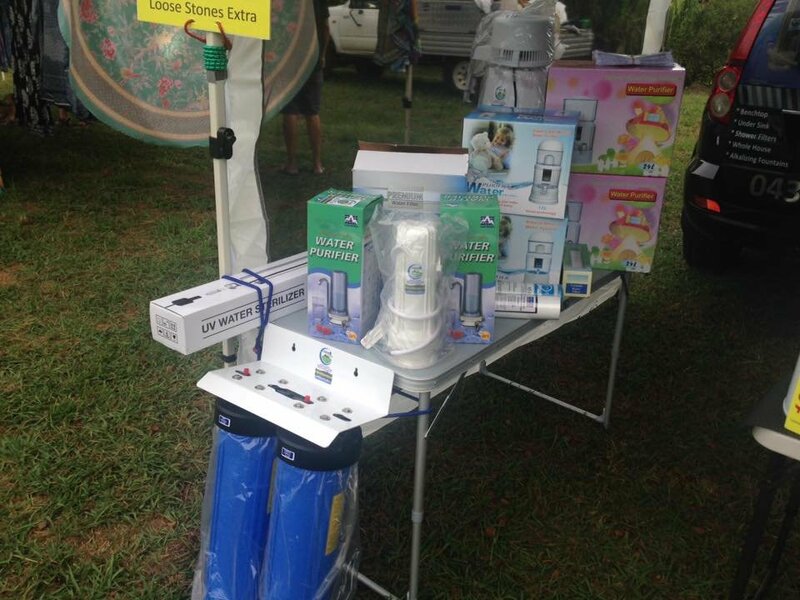 Drink only safe, clear, parasite free water as nature intended it to be from Aqua Mountain Filtration. Aqua Mountain Water Filtration- providing the best quality water filtration for over 15 years through our Nutritional Supplement business.